Have you created income for retirement that you can’t outlive? 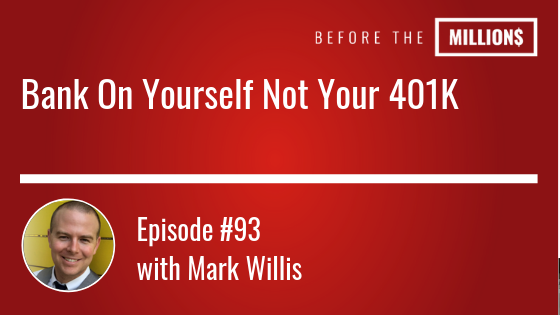 Today’s guest, Mark Willis, helps people who want to grow their wealth in ways that are safe and predictable, become their own source of financing, and create tax-free income in retirement. As a certified financial planner and best selling author, his mission is to help individuals take back control of their financial future and build their businesses with sophisticated, tax-efficient financial solutions. On today’s episode we get into emotional financial intelligence. Dave Ramsey influenced Marks financial decisions early on but quickly came to realize that there was a better way for himself and family. Our emotions play a major part in our financial decisions as well as our financial indecisions. Many of us are depending on a traditional 401k savings to sustain our retirement years. You will be absolutely shocked at just how little the 401k will mean to you during retirement after listening to this episode.